Join us this Fall for the first Agile conference in Arizona. 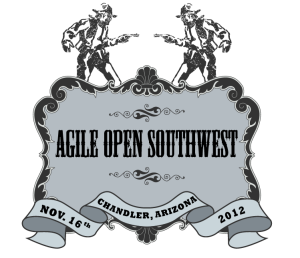 Agile Open Southwest is a regional event for agile practitioners. Perfect for those curious about adopting agile principles. Excellent for those that already agile practitioners. Suited for experts training and coaching others. Assemble and meet new people while sharing your work and thoughts. It follows the Open Space format so it will have topics relevant to those attending. Expect technical topics. Enjoy management topics. Quality assurance will surely be represented. This event is capped at 75 people. First come, first serve. Interested in being a sponsor? Get more information.